Enjoy delicious flavors without feeling guilty! Are you looking after your figure, but you cannot easily resist the view of a delicious treat with a cream. 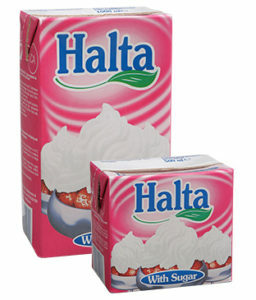 But now, you can easily succumb to temptation thanks to the HALTA vegetable-based cream. Panna cotta, tiramisu, cheese cake, but also delicious chicken or shrimp a la Crème The recipes that you use heavy cream are so many. But when your taking care of your diet, you avoid it. So now you can replace it with HALTA vegetable-based cream and indulge in all your favorite flavors without feeling guilty. HALTA vegetable-based creams are already available in the Cypriot market to give you the solutions you need for your culinary or pastry treats. 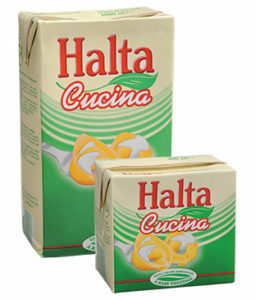 • Η Halta CUCINA Halta CUCINA (in 500ml and 1000ml packs) is a long-lasting vegetable-based cream without sugar, ideal for cooking. It is a quality Italian product perfect for making dishes such as pasta, tortellini, lasagna, sauces etc. It is delicious and creamy, easy to digest and light, without starch, low in fat and does not contain hydrogenated vegetable fats. • Η Halta Whipping (packed in 500ml and 1000ml) is a long-lasting vegetable-based cream, which when you whip it in the mixer its so light, ideal for making desserts. You can also add sugar, water and cold milk (10%) before you whip it in the mixer. It does not release water and thus does not soak the surface of the cake. Creams for whipping should be cold. So make sure to put them in the refrigerator at + 4/6 ° C at least 24 hours before using them. Need more info? Send us a message here!